School started for us today. I knew I was going to be lonely with my little daughter gone all day, so I thought I would do housework to take my mind off the empty house. Well, by 10:30 a.m., I had already cleaned the refrigerator, taken out the trash, run the dishwasher, fed the dogs, and washed two loads of laundry. I can only be good for so long…and then I have to find a sewing machine! Vintage sewing machine experts always say that old machines should be serviced, or at least cleaned and oiled before doing any real sewing on them, so I read through the instruction manual, and then I started taking the machine apart. It was much easier than I thought it would be. The instructions are very clear, and I removed the faceplate, the needle clamp and presser foot, the slide plate and the throat plate without any trouble at all. Underneath the throat plate, I found the source of the fuzzy stitching. There was so much lint packed into that small space that it had almost turned into felt! My little sewing machine brush wasn’t strong enough to clean that, so I ended up using some wooden cocktail sticks (toothpicks) to coax out all the fluffballs. After I had cleaned and oiled all the places recommended in the instruction manual, I gave the machine a really good test drive. It’s wonderfully quiet and smooth-running now, and after a few minor adjustments, the tension is perfect. Window-Matic stitch length regulator has a large window dial stitch-length indicator. Built-in sewing light with a non-glare light. Instant reverse sewing with the flick of a lever. Drop-feed for embroidery and darning. Numbered thread tension dial, self-adjusting automatic bobbin winder, hinged presser-foot to ride over pins and seams, automatic tension release, notched shuttle hook that prevents thread from tangling, and a snap-out race for convenience in cleaning. 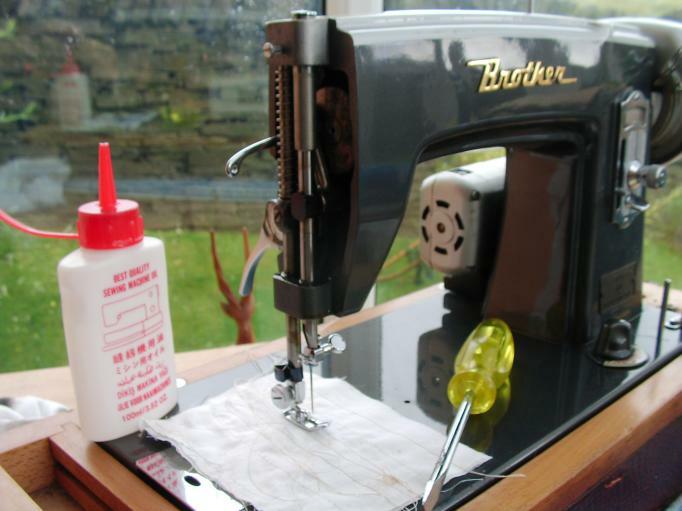 Isn’t it fun to take an old machine and clean it and make it sew like it was new?? Maybe the parts were made in Japan, but assembled in Ireland?? 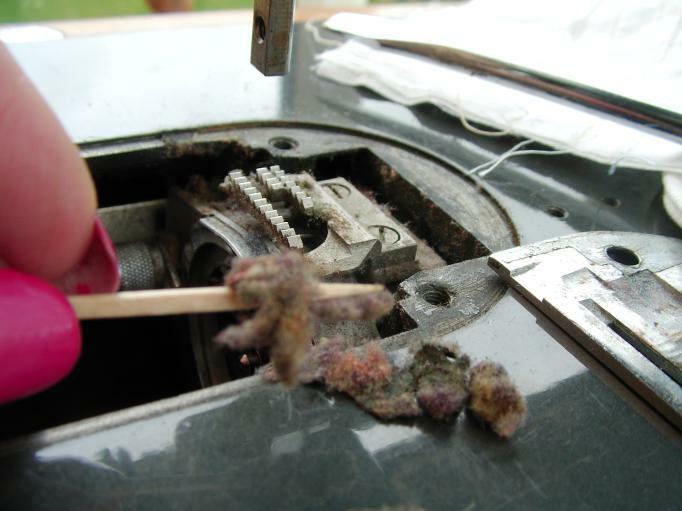 Its funny how much packed lint they can have and still sew! What a treasure you have there. 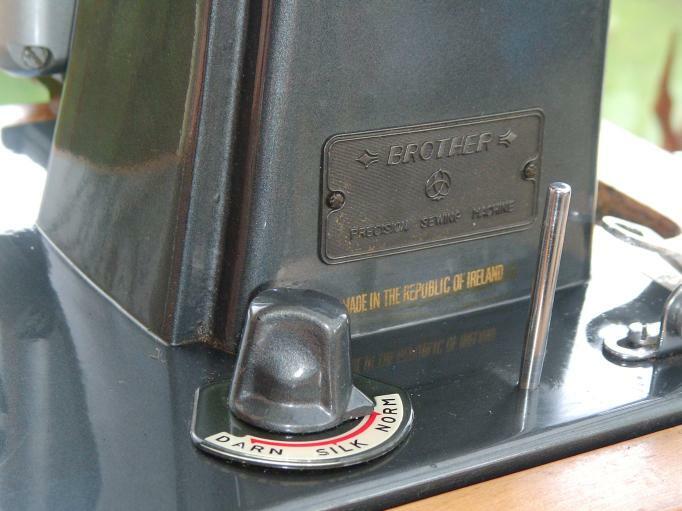 I miss my old machines… I haven’t unpacked my favorite treadle head since we moved last year. But those vintage 15 class machines just sew beautiful stitches. 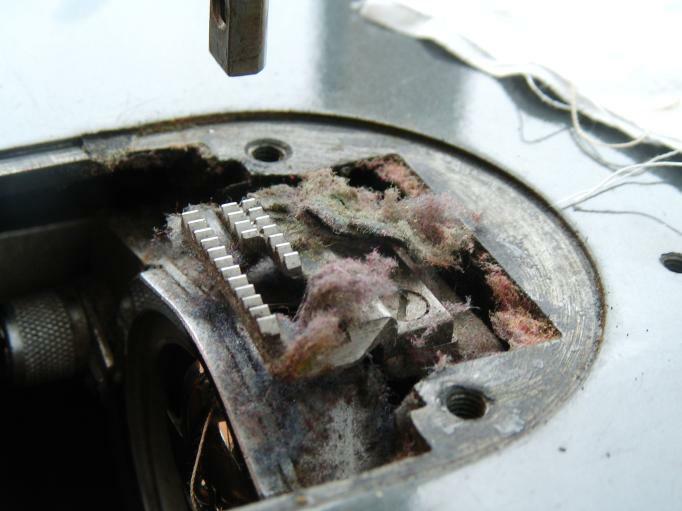 I use to work for an Old Sewing Machine Guy cleaning and tuning up any of the vintage machines he took in… amazing the amount of fluff and felt you can get out of those old machines. hi just wondered if you could help me. my mum sadly passed away last year when i was clearing out her house i came across this sewing machine. she has had it over 35 years still in workin order foot pedal and other bit’s a in a case inside the case could anybody give me any idea how much this is worth please thank you. Wow, I can’t believe I found someone else with this machine! I recently bought this from Brighton for a small fee, when I got home to test it i found it hard to thread it and also I saw the motor flashing. Could this be it needs a new motor or it simply needs throwing away? I would love to keep it as I am a fool for beautiful machines like this. Hi, glad to hear from another vintage Brother owner! The motor might need some cleaning or repairs. If you can, I would recommend taking it to a sewing machine repair person to get an estimate on repairs. It’s definitely worth a look. This model machine is wonderful and very sturdy. I sew on mine all the time and love it. I would love for you to assist me on how to thread the machine and also how to wind the bobbin. What a beautiful object this machine is! Thank you for you reply! I’m lusting after one of these right now…..Glad to have found you. I’m adding you to my list of reads! Hi Rosewillo, I have one similar to yours but it is says SEW-TRIC on it. I would love to put some photos on here of it. This was my Mum’s. I have emailed Brother to find out some more information on it. hi Rose, I am so glad I came across this post. 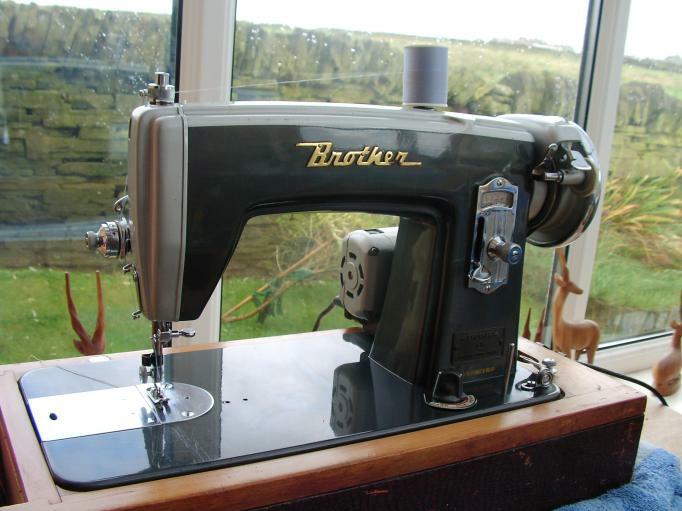 I have just acquired my Grandmother’s sewing machine, same colour and model as this one it seems. I would love to get a copy of the instruction manual, even just a photo as mine isn’t with it. I am also trying to date it, I know she got it serviced in 1960 but apart from that our guess it was bought in the 1950’s. hi Rose, that would be fab. Am enjoying using my machine, made two lovely tablecloths for xmas. Happy new year. Hi Charlotte, I’ve just posted a link to free PDF instructions. Best wishes! Hi Nev, I think this machine is circa 1955. You should be able to find a compatible power cord on eBay. I have just posted a link for a free PDF download of the instructions, if you need it. Best wishes! 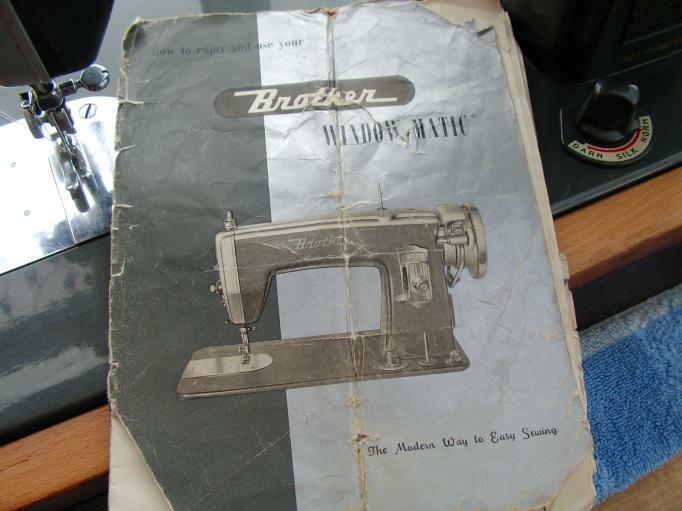 Hi to all, I just acquired a set of Brother Window matic sewing machine from ebay. There is no manual or instruction. Can anybody send me the scan copy of the manual or instruction please ? My email address is : fhwan88@yahoo.com.hk. Thank you in advance.